When is it worth it to “nickel and dime” someone? I’m not talking about saving a dollar here or there by using coupons or waiting for a sale, but the savings gained by negotiating a slightly lower price. My case in point is two friends who are about to sign a yearlong lease for a loft in a good location in downtown Providence, RI. The apartment comes with two covered parking spots, a major perk in a snowy climate. All apartments come with at least one space because overnight parking is not allowed. The landlord, a casual friend of my friends, agreed to leave the place vacant in June and July so my friends can move in August 1. The landlord is willing to lose two months rent to secure responsible tenants, I’m guessing. He could find other tenants, however. Apartment vacancies are dropping in Providence because of rampant home foreclosures in a state that has the fourth highest unemployment rate nationwide. The vacancy rate was 7.6 percent in the third quarter of 2009, according to the Providence Journal. As a consequence, rents are rising. The landlord is asking $1,250, which is a bit high for the city they live in. Average rent for a two-bedroom apartment is $1,003, the ProJo reported. My friends really like the loft but are considering asking to pay $1,200 a month, which would save them $600 over the year. The savings are significant to my friends. One of them is unemployed and the other is living off student loans while in law school. But they are worried asking for lower rent will damage their relationship with their landlord/friend, or at the very least make it awkward in social situations. At what point does saving money end up costing more in bruised relationships? Is it possible to keep the business of negotiating rent out of the friendship? Bottom line – should my friends ask for lower rent? Money morality – do you accept money from parents? Money morality – legit to shop at thrift stores? 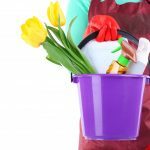 A Little Spring Cleaning, A Whole New You! Nordstrom sale, free sample of granola, and more! Do not ask for lower rent! The landlord/friend is already doing them a favor by accommodating their move-in date. $50 a month ($25 each) is not worth damaging a friendship. I don’t think the $50 savings is worth the risks involved. The landlord is leaving the place empty for 2 months. There are 2 covered parking places. The landlord is a casual friend. They would be better off saving $50/month off groceries, no cable, or entertainment. It never hurts to ask as long as no one pouts if the landlord says no. I would also reccomend asking in person so they can read the landlords reaction and act accordingly. It’s not worth it! He is holding it empty for 2 months which is saving them $2500, worth alot more than a possible savings of $600. I think they should ask for more off! $100 less per mo. maybe? He really isn’t doing them that big a favor if he charging so much more than the average price of an apartment. It sounds to me like he jacked up the price so he could not lose when he keeps the apartment empty for two months. I don’t think it hurts to ask. If he says no and they really want to live there they’ll pay with no complaint. If he really wants them to live there and can afford the small loss he’ll say yes. Maybe meet in the middle of $100 and they’ll actually get the $50 off they wanted.